The 2016 Sprinter Cargo Van Built to build your business. The 2016 Mercedes-Benz Sprinter Cargo Van features Best-In-Class cargo room and payload, 1 along with towering available interior standing heights of up to seven feet. The Sprinter's 5'x8' load floor offers abundant room for plywood, sheetrock and other material, while a standard turbo diesel engine delivers up to 18% 2 greater fuel efficiency. And, to protect your business, standard Crosswind Assist 3 helps keep your vehicle on course in strong, gusting winds. 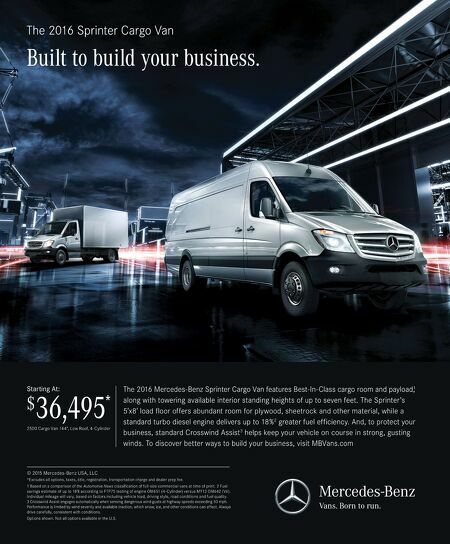 To discover better ways to build your business, visit MBVans.com 2500 Cargo Van 144", Low Roof, 4-Cylinder $ 36,495 * Starting At: © 2015 Mercedes-Benz USA, LLC *Excludes all options, taxes, title, registration, transportation charge and dealer prep fee. 1 Based on a comparison of the Automotive News classification of full-size commercial vans at time of print. 2 Fuel savings estimate of up to 18 % according to FTP75 testing of engine OM651 (4- Cylinder) versus MY13 OM642 (V6). Individual mileage will vary, based on factors including vehicle load, driving style, road conditions and fuel quality. 3 Crosswind Assist engages automatically when sensing dangerous wind gusts at highway speeds exceeding 50 mph. Performance is limited by wind severity and available traction, which snow, ice, and other conditions can affect. Always drive carefully, consistent with conditions. Options shown. Not all options available in the U.S.